I’d like to start by acknowledging that we gather today on the land of the Wurundjeri people, and paying my respects to their elders, past, present and emerging. I recognise that this has always been a place for commemorating and celebrating the dear and the departed, and that sovereignty was never ceded. I hope it’s neither too cute nor impertinent to say that Zelda was my elder. Not in a familial sense, of course, and not just on the obvious score, in that she was older than me. I mean in a spiritual sense. Zelda was a leader, an authority figure, and I looked up to her, from a reverent distance. I was born in 1969, the year THAT photograph was taken, the photograph of Zelda chained to the front of the Commonwealth Buildings. It’s an image that I feel has somehow lived with me my whole life. I can’t remember when I first saw it. I’ve tried to pin point the moment, the context. But I can’t. 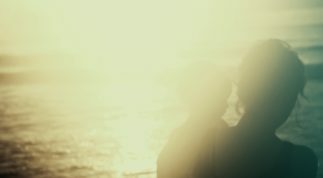 It just exists, like the ocean, like a constellation, like a lullaby. It’s embedded deep in my psyche and cosmology. If I can’t recall the first time I saw the photo, I can certainly remember the first time I got to speak to Zelda about it. It was, in fact, the first day I ever met Zelda, just 11 months ago, in her aged care facility in Carlton. I was interviewing her for a series about history and photography for Radio National. I was ridiculously nervous but she soon put me at ease with an affectionate laugh and a gentle pat on my hand. I learnt many things on that day. I learnt about how the idea for her chain-up, as she called it, came into being; how she did it on her lunch break; how her mates in the maritime union bought her the heavy chain; how Zelda herself tipped off the media and made sure a photographer would be present; how she made the clothes she was wearing; and how she didn’t have anything to drink for hours before the protest for fear she’d have to go to the loo while affixed to the front of a building. I also realised that day, that to be a progressive woman is, paradoxically, to acknowledge those who have come before. Like Zelda, Muriel had concealed a length of chain in her garments. She risked both ridicule and arrest by padlocking herself to the metal partition in the Ladies Gallery that symbolically and structurally separated women from the body politic that was supposed to represent them. It’s a story that not enough of us remember now, but Zelda certainly knew all about it. ‘Oh yes’, she said to me, ‘yes I had them in mind’. She also told me things that day that resonated with other aspects of the research I’d been doing. She said that a male onlooker asked her what one woman’s protest might possibly do, and she replied that she might be the only person at the Commonwealth Buildings that day, but the next day there would be two, and then there would be three, and then there would be a multitude. This too was something the British suffragettes said: that at first there would be a trickle of women alive to the need for militancy if they were to win their freedom, but watch for the deluge. They were right. And Zelda was right. She was at the forefront of a new era of women’s social and political activism. But not because it was the natural way of things, that change will inevitably come, like dominoes falling through some kind of law of physics, but because Zelda herself made it so. In an era when women had few educational, occupational or cultural choices, Zelda reminded them that they had sovereignty over their own bodies: where they put them, how they used them. Sovereignty over the self was never ceded. 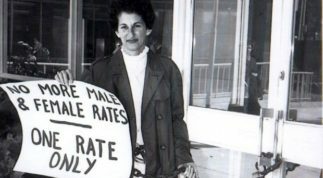 In 1970, Zelda, along with Alva Geikie and Thelma Solomon, started the Women’s Action Committee, mirroring the actions of younger women around Australia like Anne Summers in Adelaide who were cutting the chains of convention, privilege and prejudice to fire up the second wave of the Women’s Liberation movement. She built it, and they came. To say that Zelda was a force of nature is to imply that her skills, talents, intelligence and commitment were somehow god-given. I don’t think that’s true. But I do think that in some fundamental way, all of Zelda’s actions were calibrated — like an earthquake, like a tsunami —to upset and disrupt the political layers and legal sediments and social structures that had been laid down over time so as to appear immutable, unyielding. In Zelda’s hands, all that was solid melted into air. She undermined the notion that there was a right way for a woman to behave, a proper place, a conventional path. We have to remember that in 1969 there were few if any female newsreaders, print journalists, social commentators, even academics. Zelda knew her behaviour would be judged by the male commentariat, just as the women who worked in factories answered to male foremen and bosses and union officials and the women who went to court stood before male lawyers and male judges. It didn’t stop her. As a human wrecking ball, she was nothing if not dignified, modest, and, by the time I met her at least, gentle. But that doesn’t mean that she was polite. If anyone took the lyrics of her contemporary, Glen Tomasetti, to heart — don’t be too polite girls, don’t be too polite — it was Zelda. Zelda, it seems to me, honoured her true self, her most disruptive self, right to the end. In September last year, Zelda was awarded an honorary doctorate by La Trobe University for, and I quote, a lifetime of significant service to the nation’s workplaces, the women’s movement and to Australian culture. I had the good fortune to read the citation at the ceremony. Few people, it said, so perfectly embody the La Trobe University values of social justice, inclusion and equal participation for all. In the week of the graduation Zelda was too frail to come out to the La Trobe campus to sit on stage in the Union Hall in front of the other graduates and their proud parents. So the University came to her. The event was filmed, with the video to be played later at the graduation ceremony, so Zelda knew she would still have a wide audience when she gave her acceptance speech. I think it was perhaps the only graduation address ever delivered, possibly in the history of higher education, where a woman has mentioned her abortion. Her illegal abortion, she told us without flinching. Zelda was not too polite girls. But of course her point wasn’t gratuitous. She wasn’t attention-seeking, aiming to shock or making a plea for sympathy or special consideration. Her point was about power: who has it, and how it is used. She was so very pleased, she told us, that her work — particularly her book — had finally received academic acceptance, when she had so often exposed herself about her private affairs, which are in fact, she said, political. To be a progressive woman isn’t a fashion statement, a hashtag or a sales pitch. It’s a way of being. It’s putting flesh and bone and action to the aphorism that you have to be the change you want to see. 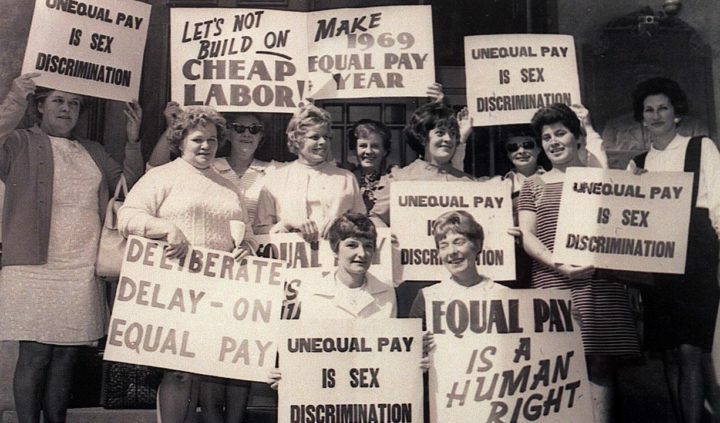 The issues that progressive women campaign for might change over the years. For the suffrage campaigners, it was the vote, the right that covers all other rights, as Vida Goldstein used to say. In Zelda’s day, it might have been the right of a woman to stand on the street or in a courtroom or in the workplace and have her voice heard. Today, it might be the plight of refugees, the future of our planet, the process of truth and reconciliation, or the entitlement to safety in our own homes. It always seems to be equal pay for equal work, something that the suffragists themselves advocated, way back when. The issues might change but the meaning of being progressive doesn’t: to care for and commit to the rights, needs and ambitions of the dispossessed, the oppressed, the vulnerable and the luckless. 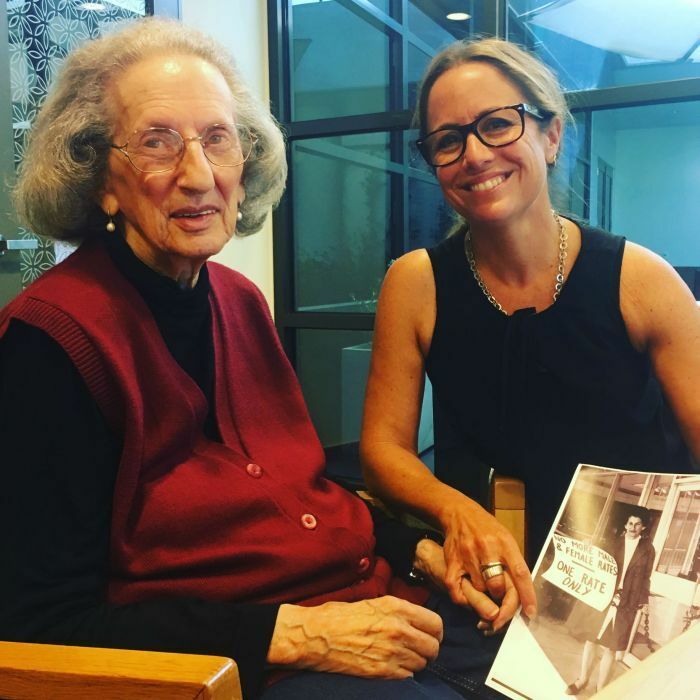 Zelda’s work as a progressive woman will continue to live on through the many women she has inspired, encourage and, to use a terribly modern, bureaucratic phrase, mentored into being a truer, more courageous version of themselves. Her memory will live on through that photograph, which will continue to be part of the firmament of feminist iconography. And it will live on, I hope, through a wider public recognition of the role that women like Zelda have played in shaping our nation. The years might have limited Zelda’s mobility, but it seems to me that age did not weary her, as we are fond of saying about other warriors, the ones, we’re told, whose spirit lives on in all of us. 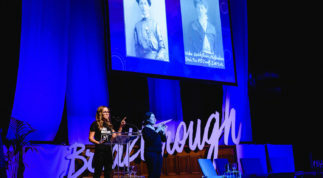 Sylvia Pankhurst wrote of her mother Emmeline Pankhurst, the leader of the militant suffragettes, she was A being of passion and impulse whose heroism has vitally transformed the conditions of her time. I think the same can be said of Zelda. I’d like to finish up, if I may, with something else that Zelda said in her graduation speech that has stayed with me, like an echo from the past and a promise for the future. I don’t know, she said, how people can live life looking at all the terrible things going on around them without doing something about it, or trying to. What they don’t realise is that apart from giving of the time, you are receiving, because you meet wonderful people along the way who are in the struggle with you. Clare Wright is an Australian historian, author and broadcaster. She is an associate professor in history at La Trobe University, and was the winner of the 2014 Stella Prize. 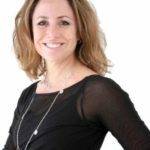 She holds a BA (Hons) in history from the University of Melbourne (1991), an MA in public history from Monash University (1993) and a PhD in Australian studies from the University of Melbourne (2002). From 2004 to 2009, she was an Australian Research Council Postdoctoral Research Fellow at La Trobe University. She was the executive officer of the History Council of Victoria from 2003 to 2004. Wright worked as a political speechwriter, university lecturer, historical consultant, and radio and television broadcaster. She is the author of a number of books which garnered both critical and popular acclaim. Her second book, The Forgotten Rebels of Eureka, took her ten years to research and write. Zelda D'Aprano was known for her decades of activism for the rights of women. 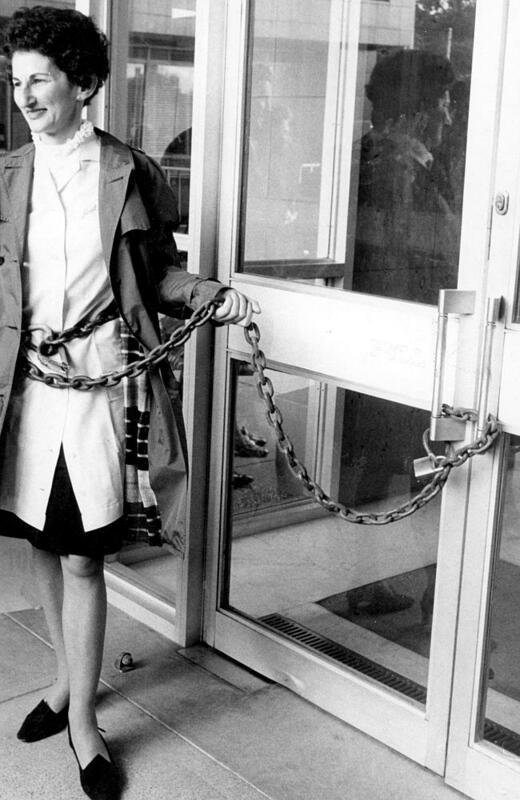 She chained herself to the Commonwealth building in 1969 to protest pay inequality, refused to pay the full tram fare (because women were not paid a full wage) and spoke out against injustice. Here she is in conversation with VWT Board Member Leena van Deventer in 2017.